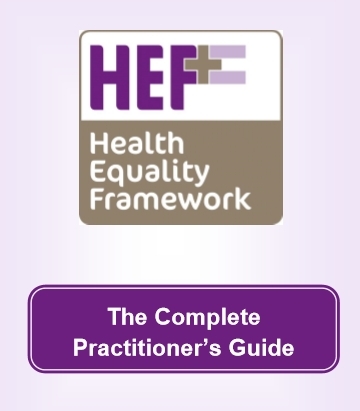 The Health Equalities Framework (HEF) was developed and launched by four consultant learning disability nurses in 2013; it has been used to demonstrate the effectiveness of care and support in reducing the impact of exposure to a range of known determinants of serious health inequalities. The Health Equalities Framework (HEF) was developed by a team of consultant learning disability nurses with support from the Department of Health (DH) in response to a growing evidence of health inequalities and premature mortality experienced by people with learning disabilities, as well as a call within Strengthening the Commitment (the report of the UK modernising learning disability nursing review) for learning disability nurse leaders to develop clear outcome measures. The HEF focuses on measuring the impact of services in terms of reducing the impact of exposure to known determinants of health inequality to which people with learning disabilities are liable to be exposed, as well as mitigating the impact of any residual exposure. The (HEF) is a systematically developed system which measures the effectiveness of service delivery in terms of reducing exposure of people with learning disabilities to known determinants of health inequalities. 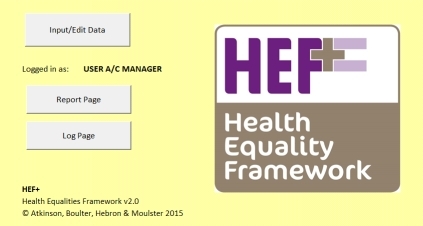 The HEF informs decision making by individual practitioners, prompts reflection on their part and a reformulation of Health Action Plans so as to reduce the risk of serious health inequalities. Analysis of aggregated, anonymised, data allows the comparative effectiveness of differing models of service delivery to be demonstrated. The aggregation of data at a locality level can inform commissioning priorities within any given area. Aggregation of data at a regional level allows the effectiveness of public health measures to be determined as well as providing valuable evidence in support of future public health strategy. Will the HEF make people with learning disabilities healthier? No. Although it will help. The focus of the HEF is on reducing the inequalities experienced in comparison to the general population. This means that effective service delivery will reduce the differences in life expectancy experienced by people with learning disabilities as well as increasing quality of life for people regardless of their health status. Some people will continue to live with chronic conditions just as the general population do. Does the HEF replace other outcome measures? No. The HEF is concerned with improving wellbeing. Many existing health outcome measures focus on measuring ‘illness’ by considering either number or severity of ‘signs and symptoms’. For people in ill health, these remain important however the delivery positive outcomes as measured by the HEF ensures a focus on proactive measures which will address long term health inequalities rather than just on treating episodes of ill health. Is the HEF expensive to implement? Can the HEF be used with Children and Young People (CYP) or indeed with adults who don’t have a learning disability? No. The validity of the HEF rests on the fact that it was developed from specifically the evidence of health inequalities in the adult learning disabled population as published by Public Health England (Improving Health and Lives) as well as a prolonged period of consultation with acknowledged leaders of adult learning disability services. Whilst intuitively many of the indicators of health inequality would seem to be more broadly applicable, the authors caution against its wider use. The Department of Health has commissioned the development of a children and young peoples’ HEF which will be completed early in 2016. Men with learning isabilities die 13 years younger than the general population; women, 20 years earlier. The HEF demonstrates how effective services are in reducing the impact of exposure to social, biological, communication based, lifestyle and service based determinants of health inequalities. The use of the HEF has been endorsed and advocated by the National Valuing Families Forum. The HEF has been presented across the four UK devolved administrations and indeed internationally. All four UK countries are promoting its use at the present time. 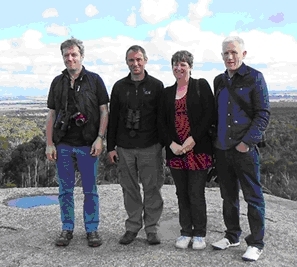 Dave Atkinson, one of the authors of the HEF, is also a director of DMA. In conjunction with our network of associate consultants, we can therefore arrange bespoke HEF training and provide advice on operational and strategic aspects of its implementation. 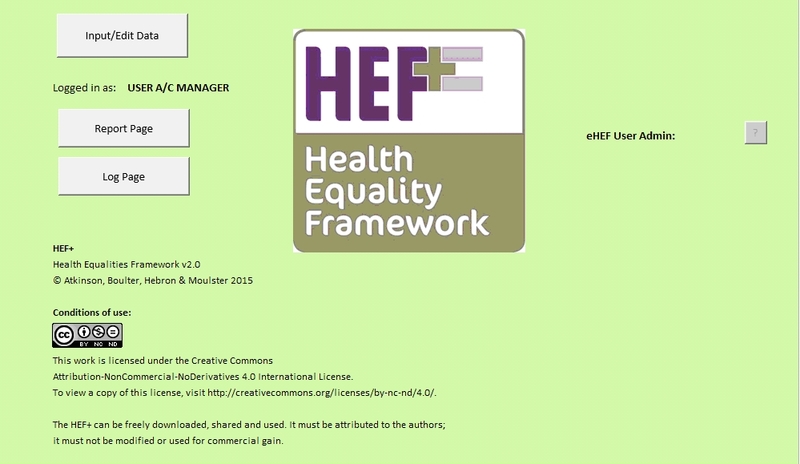 The HEF is (and will always be) available free of charge – this means that anyone can access and make use of it. However for organisations who require a more sophisticated IT based approach to delivering the HEF on a large scale, we can draw on contacts within a number of healthcare informatics companies in order to offer a range of affordable, fully licenced solutions and support services. anonymise and perform a range of basic analyses of aggregated service level data.